Michelle Myers’s 1930s kitchen needed help — the appliances were outdated, the walls and ceilings were uneven, and overall the space was dark and dingy. But due to financial constraints, a major gut and rehab was not in the cards. Working creatively, Michelle and her contractor devised a plan to update the kitchen, mixing old and new elements into a bright and open space while preserving the charm of the vintage home. 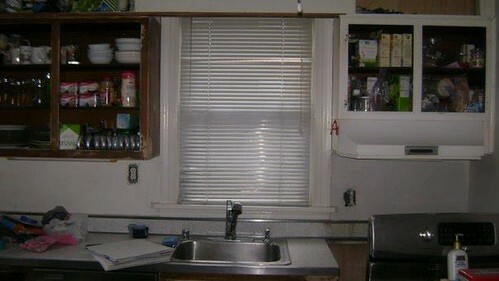 Here are a few before shots of the kitchen (during renovation). And here’s the kitchen after the renovation. Michelle kept the original cabinets and the counter tops. 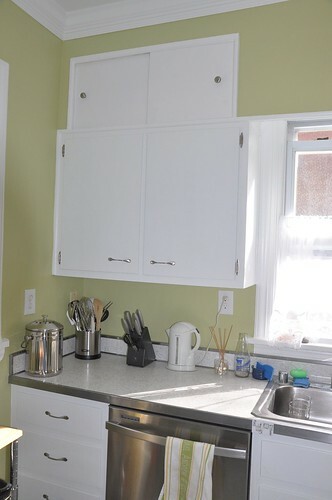 The cabinets got a good sanding, a fresh coat of white paint, and new brushed chrome hardware. 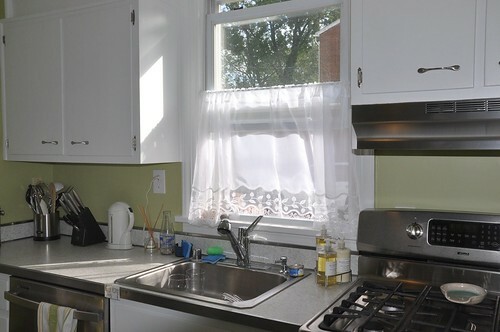 I love how the counter tops, quite possibly original to the house, are in near pristine condition. 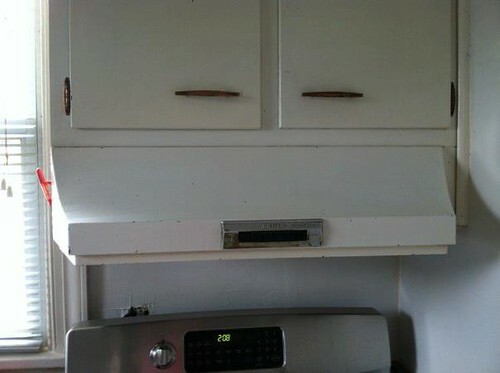 Very charming — and they look like they were meant to be next to the stainless steel appliances. 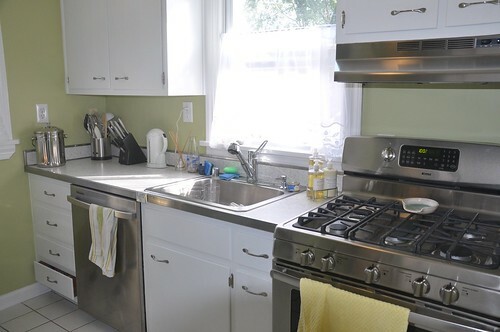 As for the new elements, Michelle replaced the old white appliances and the oven vent with all new stainless steel. 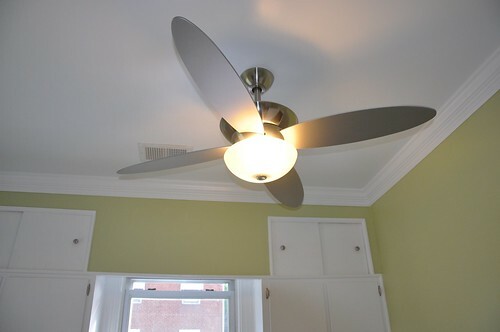 The chrome color also makes an appearance with the new ceiling fan that has a cool retro vibe. The crown molding, the contractor’s suggestion, really finishes off the room. 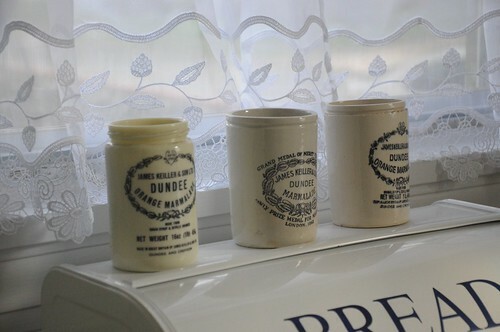 These sheer cafe curtains let the morning sun flow into the kitchen, showcasing the old marmalade canisters set atop the bread box. Michelle chose Duron’s hearts of palm (#6415) in an eggshell finish for the walls. 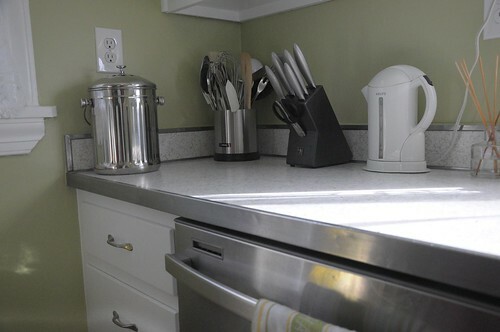 The color gives the room a fresh clean look and blends nicely with the stainless steel appliances and fixtures. In about a week and a half, Michelle got an updated kitchen that she loves. Michelle gives her contractor, Leo Sinclair, the highest praise and strongly recommends him for home improvement projects. He can be reached at (301) 908-2395 or Leosinclair1512@comcast.net. Michelle’s kitchen shows how old and new, vintage and modern, can come together to create a timeless and well-crafted room. Thanks for sharing Michelle! If you have a room renovation to share, please contact diydelray[at]yahoo.com.